I’ve been trying to pray more this year. But prayer doesn’t always come easily to me. I often sit down to pray with the best of intentions only to suddenly catch myself, a few moments later, daydreaming about yesterday’s conversation, tomorrow’s meeting, or next week’s vacation. Most of us will admit experiencing this, and the rest of us are liars! Distraction can be a huge hindrance in our prayer life, but I’m also discovering it provides an opportunity for growth. Here are seven strategies for fighting and harnessing distraction to deepen and direct our prayers. I remember hearing somewhere that Scripture teaches us how to pray as a mother teaches a child how to talk. God speaks to us through his Word, and then we speak back to him in response, much as a child listens to his parents and then responds. As the father of soon-to-be-3-year-old who’s talking more and more, and saying some truly hilarious things, this is an illustration that resonates with me! And I find it true in my prayer life. The point of the metaphor is that just as none of us is born knowing how to talk, none of us knows how to pray on our own. We learn how to pray, and more often by observation and imitation than by direct instruction. As I look to Scripture to develop and mature my praying instincts, I find it not only informs the content of my requests but also helps cultivate the impulses and appetites undergirding them. There are so many things in Scripture my flesh would never think to ask for. I usually don’t ask for boldness when I’m persecuted (Acts 4:29), or interpret my grief in light of God’s honor and redemptive plan (Neh. 1:5–11), or say things like “teach us to number our days that we may get a heart of wisdom” (Ps. 90:12). But again and again Scripture rebukes my shallow, self-oriented prayers and summons them upward into the larger context of God’s glory, the church, eternity, and the advance of the gospel. Nehemiah 1:5–11: Nehemiah’s prayer when he hears Jerusalem’s walls are still in shambles. Daniel 9:1–19: Daniel’s prayer for God’s people during exile. 2 Chronicles 20:1–12: Jehoshaphat’s prayer for deliverance from attack. Ephesians 3:14–21: Paul’s prayer for spiritual strength to grasp Christ’s love. Matthew 6:9–13: The Lord’s Prayer (often a great one to start with). I find it helpful on occasion to write out a prayer. Written prayer shouldn’t replace vocal/mental prayer—but I find it works effectively as a supplement. When you’re writing there’s a kind of mental discipline and intentionality that’s often absent in vocal communication. It’s harder to get distracted, and it enables you to channel and structure your prayer a bit more. An added benefit is being able to go back, even years later, to see how God has answered your prayers—or, more commonly in my experience, changed what you pray for. Prayer and fasting are healthy practices in themselves, but work especially well together. An empty stomach reminds us to pray, “Lord, fill my soul!” When we’re earnest in prayer, it helps us deal with the hunger pains. One thing I must fast from is social media. Social media changes the way our brains function. It speeds up information flow, clutters our consciousness, and reduces our ability for things like meditation, reflection, quiet. It’s not an easy transition from surfing Facebook and Twitter for hours to lingering before the Lord in prayer. When Jesus prayed, for instance, he often went out to “a desolate place” (Mark 1:35). Like him, we need to cultivate the discipline of solitude, the discipline of stillness before God. We shouldn’t be surprised if we’re scattered and distracted in prayer if we’re scattered and distracted all the time. 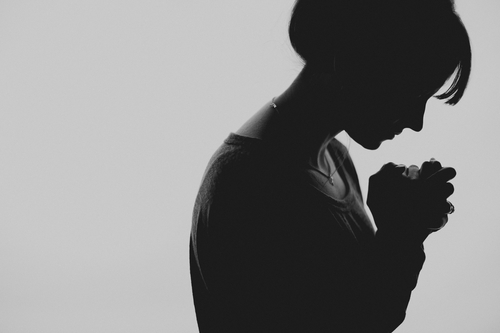 Corporate prayer and private prayer fuel one another (kind of like prayer and fasting). Corporate prayer is all the more powerful if we’ve already been praying on our own; and private prayer is instructed and encouraged by how we’ve seen God at work in the prayers of others. Not only is it harder to get distracted when you’re not out there on your own, but Christ promises his provision (Matt. 18:19) and presence (Matt. 18:20) when “two or three” are gathered in his name. It’s hard to drift off when there’s a theme or some kind of orienting structure to the prayer. There’s a kind of unhealthy manipulation that can occur in trying—through an act of the will—to stir up emotions we think we should be feeling. It’s also unhealthy to let our emotions have untouched sovereignty over our will. There’s a way to actively engage our emotions (rather than passively experience them) that’s entirely appropriate, and can help us fight distractions. David, for instance, will interrogate his emotions: “Why are you cast down, O my soul, and why are you in turmoil within me?” (Ps. 42:5); he’ll call upon his emotions: “All that is within me, bless his holy name” (Ps. 103:1); and he’ll reason with his emotions: “The LORD is my light and my salvation; whom shall I fear?” (Ps. 27:1). If there are particular emotions leading to distraction (boredom? anxiety? self-concern? ), talk back at them, as David does. Engage them with the counter-emotions called for by truth. Lord Jesus, this is where I would be without you: __________. Lord Jesus, this is where I am now with you in my life: __________. Lord Jesus, this is what you went through to do this: __________. The gospel never runs out of gripping, awful, wondrous power. Jesus has rescued us from sin, death, and eternal ruin. He’s adopted us into his heavenly family, clothed us in his righteousness, and invited us to share in his glory. And he’s done so at infinite cost—as the blood drained slowly from his veins, as he sunk down into death and defeat, as friends fled and enemies mocked, as the love between Father and Son was now, for the first time in eternity, ruptured. It’s hard to daydream when our hearts and minds are focused on the great truths of hell, heaven, and Calvary. Make them the North Star of your prayer life, and it will help you fight distraction.